Could you imagine something more beautiful than finding a white cloud in your bed? And what about something even funnier, like doing your homework with a gorilla? Or listening to the fish during the night? And, naturally, the most beautiful thing is to be able to tell and listen to these and other stories while you are sitting on a tree branch with your legs swaying. 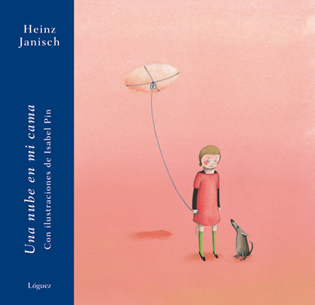 Heinz Janisch makes us be spellbound by his short poetic stories about children’s endless fantasy and Isabel Pin captures that poetry with her pictures, in a unique, unmistakable way. “It is really important for me that children enjoy the books as gifts” (Heinz Janisch). “… undoubtedly, poetic stories sometimes appear on the trees, and, specially, in picture books like this one.” (Die Zeit). A. Blau’s drawings underline the simplicity and wistfulness of the text, poetically showing the child’s feeling for her grandmother. “And, in the end, a halo of beautiful mystery remains…” (Die Zeit). “… this is a beautiful tale that is worth reading time and time again. Although it seems not much happens, we can find something new in it, something that makes as think and feel, each time we come back to it.” (SOL, Orientation to Readers Service). Recommended by Club Kirico, from CEGAL. "Zas, poom!" it sounded when Segismund, a little nestling fell off his nest. Since then, he feels sad and he is a little different from the other birds. Eventually, Emilia, an old hare will help him to recover the joy for living. A beautiful and touching story about disabilities. “An optimistic, enjoyable to read, picture book, with a first-class layout, that deals with doors that close and other doors that, luckily, open. (Cuatrogatos, Children’s Literature Magazine). “Beneath these bland colours there are lots of rich textures and shades that bring warmth to the full of movement pictures. Beyond a simple happy ending story we will find such a complex psychoanalysis session, through which the main character will eventually recognize himself and embrace his peculiarities, thanks to the help of a doctor hare and a couch” (Raquel López in Babar). Is there anything more beautiful than having a grandfather who can tell the craziest stories, the smallest and biggest miracles and the most incredible andventures? Selected for the German Prize to the best Children’s book in 2006 (picture book). “The exciting stories involving the grandfather and his grandson told by Heinz Janisch in a tender way, which are about childhood, happiness, love and red cheeks, are illustrated by Aljoscha Blau with beautiful drawings and wonderfully poetic colours, that make Red Cheeks… one of the most beautiful books, in which the text, the drawings and the edition make a perfect unit.” (Die Zeit). “The magic conjunction among text, drawings and edition has resulted in this superb picture book with surrealistic and poetic views, that tells us, among many other things, about a beautiful relationship between a grandparent and his grandson, a relationship that even survives death.” (CLIJ, March, 2007). 21 short stories that could have happened to the Little Prince. Short episodes with a second reading, drawn by Wolf Erlbruch, who again proves his great skill in transferring the high questions of life to his drawings, in a way which is easily to understand both by children and adults. “A beautiful and minimalistic picture book with short stories in a Koan zen way, starred by a king and full of metaphors and thoughts about human nature: power, man-nature relationship, Pride, Beauty…” (Babar Magazine). “A small, wise book” (Die Zeit). “The easy language depicted in drawings and texts allows both young and adult readers to think and reflect”. (Süddeutsche Zeitung). and when by the sea, you want to be at the mountain. There is only one place where you'd like to stay forever: by their side. La tensión va en aumento – la más famosa carrera de caballos del mundo va a comenzar. Inmediatamente antes, se completan las apuestas, se llenan las tribunas. Pero hay inquietud en el hipódromo: algo no es como otros años. ¿Qué está pasando?